James Hall, a co-founder of Patz & Hall, is today’s guest on California Wine Country with Steve Jaxon and Dan Berger. Barry Herbst is away today working as a judge at the Press Democrat Wine Competition. James Hall is back on the show after a couple of years. This year they celebrate their 30th anniversary at Patz & Hall. He and the other three founders came to Sonoma County to start a winery in a cool growing area, so they could make wines in the Burgundian style. Their first wine was a 1988 Chardonnay. They added Pinot Noir in 1995 and now make 20 individual wines. Dan Berger says that they are part of Carneros’ legacy. Their first vineyard was Caldwell Vineyard but their first really important one was the Hyde vineyard. James Hall is a good friend of Larry Hyde. Dan talks about how Patz & Hall represent the Burgundian style very well. They specialize in small lots and single vineyard wines. He says a 10-year-old bottle of Pinot Noir, for example, it will definitely show those special characteristics of Burgundy and they succeed at this with their whites and reds. James says that the wines are an individual expression. He comes from the cellar floor and wanted to shape the wines to his tastes. As he was exploring traditional winemaking styles, he found that the traditional Burgundian styles show the vineyard personality better than other more commercial techniques. So he uses some minimal-interventionist techniques. 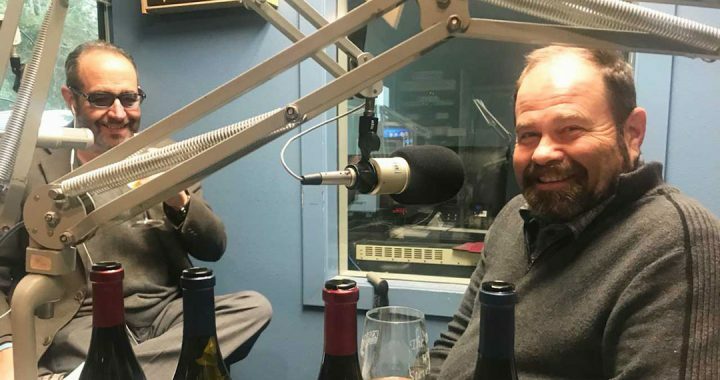 He did go to UC Davis but got lured away from a job offer at Flora Springs Winery in St. Helena where the winemaker Ken Deis offered him a job on the spot. He considers Ken to be a great mentor. They were doing barrel-fermented Chardonnay in 1983 which was considered revolutionary in Napa at that time. They are tasting the 2014 Ritchie Vineyard Chardonnay. Dan says it tastes of full ML and some new oak flavors, but the center of the wine is the citrusy fruit. The strength of it is that it would go well with food. Ritchie Vineyards is where they grew these grapes, from a vineyard that Kent Ritchie planted in the mid ’70s. It has ideal sandy loam soil that yields green apple flavors, the perfect Russian River Valley character. 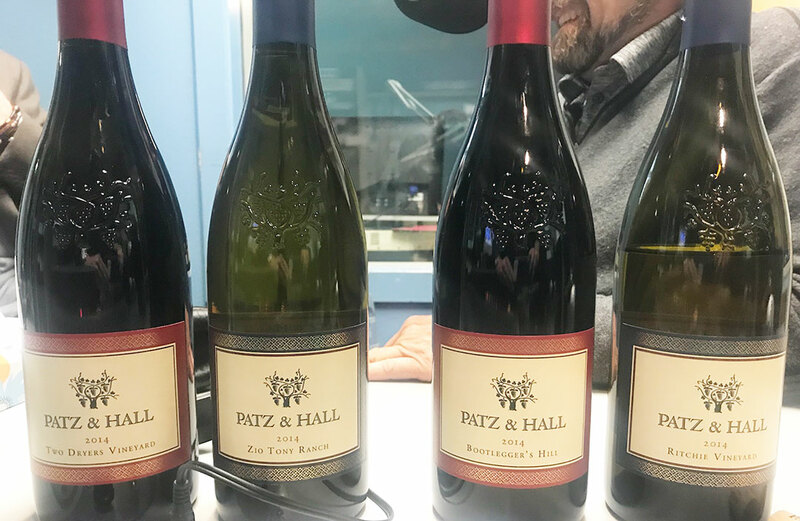 Dan says that the Patz & Hall winemaking project has stayed true to its roots all the time, and its style has never wavered. The second wine comes from vineyards of the Martinelli family, called Zio Tony Ranch. “Uncle Tony” managed all of the Martinelli vineyards for many years. Now George Martinelli manages it and he has been making this wine since 2004. This is also a 2014. It is one of the coolest vineyards he works with. Steve notices great minerality. James says he had the privilege of building his dream winery, after working for others for so long. He saw a property with a Tuscan Villa on it, recently built, which they bought, and converted into the tasting room. They call it The Sonoma House. Visitors can make reservations. Dan is impressed with the two Chardonnays. James Hall says that 2014 was a warm year lower in acid. He was able to have the grapes harvested at just the right time in the different vineyards. They have also started making sparkling wine. 2012 was the first year they produced it and their 2013 is just out. Tirage Sparkling wine is fermented twice; the first one produces a low alcohol higher acid table wine, the second is tirage, in the bottle, five years on the yeast. Today Barry Herbst and Dan Berger were judges at the Press Democrat Wine Competition. They judged 112 wines today and will do between 35 and 50 tomorrow. They will only be publishing the Gold Medal results, no seconds or thirds, so judges are encouraged to find the very best. Dan asks James about his vineyard sourcing for the Pinot Noir. Their first Pinot Noir year was 1995. From ’88 to ’95 they only made Chardonnay, mostly from Carneros. But then they found that the best Chardonnay and Pinot grapes were grown in Sonoma. So they looked for the best Pinot Noir they could find and how he makes 12 different ones. They taste the Two Dryers vineyard, owned by the Sanchietti family. Mark Sanchietti came to him and found an apple orchard that had old apple dryers. They planted 12 acres of Pinot Noir and called it Two Dryers Vineyard. This is only the second bottling of this wine. Dan tastes a lot of fruit, bright black cherry and raspberry fruit. The oak is very light, and underscores the acid so it will be even better in 5 years. James says the vineyard is located south of Sebastopol, sometimes called Sebastopol Hills. It gets cold air and some sun which contributes to its acidity core. Now they taste the second 2014 Bootlegger’s Hill Pinot Noir. Dan and Steve note the Cranberry aromas and black pepper tastes. He only makes about 400 cases of these. James Hall also gets the black cherry component that speaks to the heart of Russian River. This wine has all the components to age beautifully. It still tastes awfully young and Dan says this needs another couple of years. Dan says cool climate will give you that peppery finish.